Every year Lanesboro holds a festival in honor of rhubarb. It is one of the many small town festivals around Minnesota in the summer and it gives a great excuse to visit one of the best small towns in Minnesota. The festival itself is pretty small, they have Rhubarb Olympics where you can throw, toss, and hit various forms of rhubarb, a small farmers market, live music/entertainment, and all the rhubarb you can eat (which isn’t much). The festival itself is very small (contained in a park) but the reason we go back is to experience all of the small shops and restraunts that Lanesboro has to offer. Check all my pictures here. About a week ago I saw this post on mythtvnews.com and was immediately inspired to try hacking together a mythtv frontend for our bedroom TV (connecting to the backend/frontend mega box we have on the living room TV). I have been using MythTV on the TV in the living room for over a year and I love it, it is the perfect one stop media box for us. Point is it is a beast of a machine, but we use it all of the time for recording/watching tons of TV, it holds our entire DVD collection, it holds my entire (non-DRMed) music collection, it holds a gallery of all our pictures, we use it for weather, internet radio, and as our print and file backup server. Which is all great in the living room, but we have two other TV’s in the house that are used frequently and we really wanted to bring all of that media to them as well. I had been looking at running mvpmc on a MediaMVP box as a good low cost solution for these TV’s, however it does not have a full MythTV frontend and has no prayer of being able to play HD. As a fill in solution we have been using MythTV Player which is a windows program that can play recordings off the backend along with accessing the movies and music over samba share. It was a workable solution, but HD did not work over the wireless and it meant watching TV on a laptop which isn’t a great bedroom solution. When the Apple TV came out (as when any media playing device comes out) the entire MythTV community started asking if it could be hacked to run Linux and what kind of MythTV performance could be expected. Just on face value the Apple TV looks like a perfect MythTV box, it has Ethernet, HDMI, Digital Audio, Component Out, Analog Audio, an IR Sensor, and a USB port. It is definitively not a heavy-weight in the power department, but considering it is in a small elegant package and is passively cooled it is not bad. The question was, is it good enough? After reading the mythtvnews post and doing a little research I decided to try it for myself. I ran to Best Buy, laid down my $229 dollars and was ready to start. I decided that I would try the Gentoo install following this wiki page. I chose Gentoo for two reasons, I liked that I would be compiling everything for the hardware and I wanted to learn about Gentoo (My other MythTV box is an Ubuntu install). There are other options out there (including Ubuntu) and even some that work in conjunction with the Apple TV software so you don’t have to loose the Apple TV functionality. Seeing as how I really just wanted MythTV and I wanted it to perform as best it could, a Gentoo clean install seemed like a good path. As far as the Wiki HOWTO, it was pretty good. From looking around online you can see the sources that were pulled from to compile it, and sometimes they have a little more information. For me it worked great up until getting into the thick of the Gentoo Install, specifically after booting onto the live system (no USB patchstick) and attempting to install everything. Most of my issues were because I had never used emerge before and had to stumble a few times before I got everything configured correctly. After getting everything installed I ran into a couple issues getting the sound to work (the wiki explains how to get digital sound working, I needed analog) and getting XvMC and MythTV to play nicely together (looks to be related to the MythTV version I installed). However, after 12+ hours of time spent compiling (it is just a 1 GHz processor) and another 6+ hours of time on my part debugging and learning about Gentoo, the system is up and running. First off, this little box is impressive. It can play HD, stream movies, and is pretty snappy (not like running on a quad-core but good enough). However, I will say that hacking the Apple TV is still in it’s early stages and while all of the information is out there on how to do it, it is definitely not for the faint of heart or the easily frustrated. Many of the threads that talk about problems end abruptly with no solution and sometimes you have to look at other distributions Wikis and translate it to the one you are using. Of course this is a problem with finding help on any Linux install, but with the scarcity of sources on doing this the frustration can be amplified. I imagine that all of the information will mature in the coming months and the Wiki pages will get more complete. I would be interested to hear if people have an easier time with Ubuntu (I imagine so) and if the performance is as good. I currently have only one issue left to resolve (getting XvMC to play nice with MythTV) and this looks more to be a legitimate bug somewhere then a problem related to Apple TV. Even with this problem I can watch up to 720p HD with no issues, it is just the higher resolutions that are choppy. This is the boot loader project that makes all of this possible. The have some good information in their Wiki and also the config options to using inside MythTV to get HD to work. The “Audio” section here is where I found the fix for Analog sound. Everything else I found told me I had to patch and recompile the Alsa driver, this is much easier. This forum post (and the bug reports it links to) is the closest match to the issue I am having with XvMC. Unfortunatly following the directions did not fix the problem. Setting up LIRC in Gentoo (I did not try to get the remote that came with the Apple TV working, too few buttons). As I mentioned in the last two posts, this morning my GMail account was hacked. In the panic that followed I went through a lot of work trying to check to make sure all my other accounts were ok (Credit Cards, Paypal, etc) while at the same time trying to figure out how to get my account back. The surprising thing to me was that it was not obvious to me how to get through the help to the form I needed to fill out, and when I got to the form trying to find the verification information they wanted took some ingenuity on my part. What would have really helped me was to have some simple directions to follow to find what I needed fast (to get the hacker away from my account as fast as possible). Seeing as how I did not find such directions out there I figured I would write my own to help someone else if this happens to them. The other part that caught me off guard was what information Google wanted from me in order to verify my the account was mine. Much of this info was tough for me to find, because I have been using GMail as my only personal email account since back in the early “invite” days. So I recommend that everyone takes a second to write down a few things while they have access to their account to save themselves a good amount of time later. To start with here is all the information I wish I would have had immediately available to me when trying to verify my account. Keep in mind that Google doesn’t need all of this to verify your account but the more you can give them the better chance you have of them verifying the account. Most recent secondary email. When you setup your GMail account you gave Google a secondary email account, this is the account they use for sending password resets etc. If you are like me then right now you have no idea what email address this is. You can look in your Google Account Settings (not GMail settings) under the “Change Security Question” link to find it, and if it is out of date update it. Email addresses of up to five frequently emailed contacts. This one might be easy for some people, but outside of my Wife I don’t send much email from GMail. The best way to find this is just browse through your “Sent Mail” and write down some email addresses you send too often. I was lucky enough to find a replica of this folder on my iPhone to figure this out after the fact. Names of up to four labels. I use labels to organize all my email, and hopefully you do too. If you do, write down four labels you use (and I assume the less common the better). I could have probably done this one by memory, but I did check the replica on the iPhone to find unique ones. Remember that being as exact as possible is important (Where are the spaces? What letters are Caps?, etc). GMail Invite Information. If you were invited to use GMail then that invite information can have a wealth of information that could be useful. Google will want to know “Invitation URL”, “The Gmail username of the person who invited you to create an account”, and “The email address to which your invitation was sent”. For me this was long enough ago that the invite is long gone, luckily Google didn’t hold that against me, but if you have this information find it and save it. Account creation date. 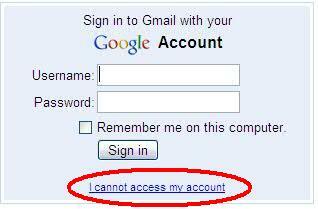 This means your Google Account (which is probably the same date as your GMail account, unless you set it up earlier). Again if you have an invite this is easy, it is probably the date you got your invite. If you don’t, then in GMail you can click on “All Mail” and then goto the “Oldest” mail and as long as you don’t throw things away that should give you a good idea. When you started using other Google products (including GMail). All you need is a rough idea, but if you have access to when you started using any products write it down. I was able to put down a rough estimate for these so don’t stress about the exact day. Remember that you don’t need all of this info, but the more you have to give them the better. 2. So your GMail got hacked, now what? 3. This is where you need to be exact (choosing other options leads to other forms or no form at all). 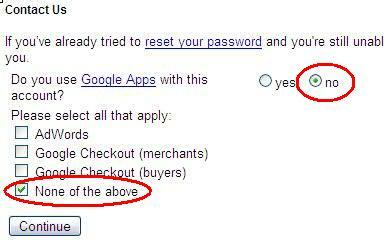 Select “No” when it asks about Google Aps, and in the list on products select “None of the Above”, then click “Continue”. This was complicated for me because I did have some of the above, fill out this “None of the Above” form first and then go back and fill out other forms if needed. This should bring you to a form where you can put in the information listed in the above section. My request had a prety quick turn-around from Google (about half an hour) but I imagine depending on the information you give them this can be variable. After submission they give a “don’t call us, we’ll call you” sort of statement, so I imagine it could take a while. I was caught off guard by all of this and I imagine pretty much everyone is, but it made me think about some ideas that I am going to use from now on “just in case”. Forward Email. It is pretty easy to find a place that will forward your email anywhere you want. The beauty of this is that if something goes wrong with your “backend” account you can immediately divert your incoming email to a different account. If the account allows you to save and forward that is even better because then you have a copy of your email “just in case”. Immediatly delete email that has sensitive information in it. You shouldn’t be getting email with sensitive information in it in the first place, but if you do don’t keep the email around. You don’t want to be stuck worrying about other accounts or personal information if you get hacked. Make sure you have multiple passwords for different purposes. Considering how many places just take email address and a password for login, you want to make sure that if someone gets your email password they can’t get access to many other accounts. My suggestion would be to have at minimum an “Everyday” password and a “Sensitive” Password. That way if someone gets your everyday password your sensitive information is secure. I am sure there are plenty more tips out there, but these three were born out of my immediate concerns after getting hacked. I hope something in here is helpful to someone out there, and if you have more suggestions, tips, etc put them in the comments so all can see. Well after some searching and Jon finding the right checkboxes on the google help pages to get to the right form I was able to submit and get my email address back (after providing lots of info to google to prove that it was my account). I apologize for the spam everyone got and thank all those that were concerned about us being stranded in Africa 🙂 I assure you Amber & I are safe at home and are not in need of your money. I am still going through and checking accounts and changing usernames and passwords, but for the moment it doesn’t look like anything else was compromised.